All heavy sham (thick base) and oversized glassware must be handled with care due to the very nature of the glass. The thick sham (base) will always retain heat longer than the thinner sides of the glass. Touch a warm glass on the side and then the base. You will notice how much warmer the base is. The base always cools off slower than the balance of the glass. Although you may think the glass is at room temperature, it isn’t thoroughly. All glassware is subjected to ASTM testing regulations at the time of manufacture. Glassware manufactured for the purpose of holding hot beverages are considered to hold beverages at a maximum temperature of 65 degrees celsius. Glassware manufactured for the purpose of holding cold beverages are considered to hold beverages at a maximum low temperature of 6 degrees celsius. 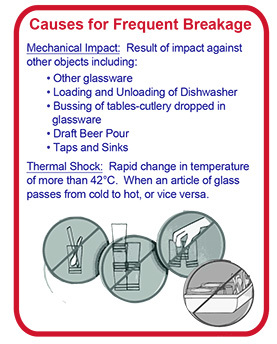 All glassware is rated for a regulated, controlled temperature change of 42 degrees. Sudden and rapid temperature changes are to be avoided as breakage can occur. Ensure the glassware is at room temperature prior to use. Use double the time of a regular glass cooling, as a rule of thumb. Do not store or place the glassware in a glass chiller, freezer or fridge. Whenever possible use a glass rack or store on trays. Whenever possible, wash glassware early in the morning or evening to allow sufficient cooling time. Never smash or stack glassware when clearing tables. Do not put cutlery into glassware when clearing the tables. Ensure proper washing temperatures in your glass washers. Ensure you have sufficient glassware to permit proper cooling times. Never pour cold beer in a warm glass. Never pour cold beer in a glass directly out of the glass washer. * ALL GLASSWARE PRODUCED BY ZENAN CUSTOM CRESTING MUST BE WASHED IN A DISHWASHER PRIOR TO FIRST USE. Thermal Shock – Rapid change in temperature of more than 42 Degrees celsius. when an article of glass passes from cold to hot, or vice versa. Thermal shock is the name given to cracking as a result of rapid temperature change. Glass and ceramic objects are particularly vulnerable to this form of failure, due to their low toughness, low thermal conductivity, and high thermal expansion coefficients. Thermal shock can be prevented by reducing the thermal gradient seen by the object, by changing its temperature more slowly. Thermal shock occurs when a thermal gradient causes different parts of an object to expand by different amounts. This differential expansion can be understood in terms of stress or strain, equivalently. At some point, this stress overcomes the strength of the material, causing a crack to form. Thermal shock describes the way in which some materials are prone to damage if they are exposed to a sudden change in temperature. Glass and certain other materials are vulnerable to this process, in part because they do not conduct thermal energy very well. This is readily observed when a hot glass is exposed to ice water – the result is cracked, broken, or even shattered glass. Thermal shock is a reaction to a rapid and extreme temperature fluctuation, but the process is somewhat more complicated than this. The shock is the result of a thermal gradient, which refers to the fact that temperature change occurs in an uneven fashion. Temperature change causes expansion of the molecular structure of an object, due to weakening of the bonds which hold the molecules in formation. The existence of the thermal gradient means this expansion occurs unevenly, and glass in particular is very vulnerable to this process. * ZENAN WILL NOT ACCEPT RESPONSIBILITY FOR BREAKAGE DUE TO THERMAL SHOCK, OR BREAKAGE CAUSED BY CONSUMER IMPROPER HANDLING OF GLASSWARE.